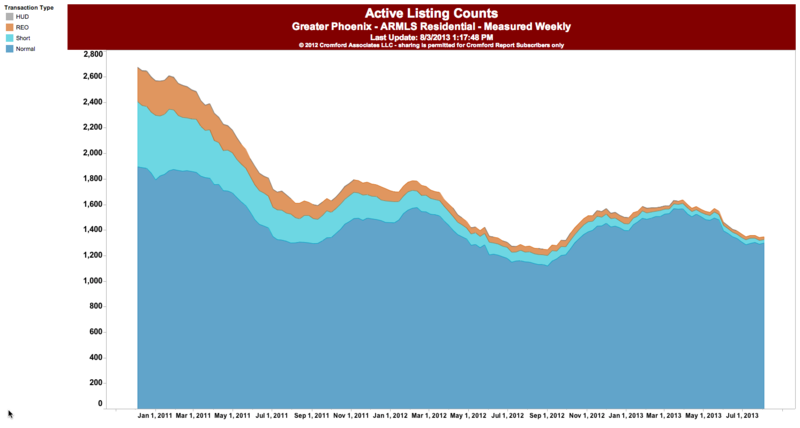 New non-distressed SFR listings in Scottsdale increased about 25% from Jan-July 2012 to Jan-July 2013. However, net new SFR listings overall in Scottsdale only increased about 5% because new distressed listings were falling fast while new NON-distressed listings were rising fast. Next year new distressed listings will be so low they won’t really be able to fall much anymore. If new non-distressed listings continue increasing at around 25% next year (very possible), the number of net new SFR listings in Scottsdale overall could also increase by about 25% because they won’t be offset by falling numbers of new distressed listings. I reserve the right to change my mind after lunch. Excludes homes under contract. Click graph to enlarge. See the same style analysis for Chandler, Arizona.